First of all a Merry Christmas to all my readers! Even though I don’t blog as much as a few years ago (mainly because of Facebook), the number of readers of this blog still goes up slightly every year. This year I had over 63,000 unique visitors so far, in 2014 that was just over 56,000. The increase mainly comes from Canada, that’s now the number 3 country in terms of readers and it passed The Netherlands which is now in 4th place. In 2015 I taught Scott the basics of computer programming. We started off with some Python during the school holidays, and after blogging about that one of my readers suggested to check out Scratch. I did so and it’s the perfectc language for kids: easy to understand, not much typing required (it’s drag and drop) and a steep learning curve that allows kids to make games in days instead of weeks or months. Scott did a college level Scratch course over the past months, and I helped him with some of the concepts that he was not familiar with yet. For example, if you don’t know that a circle is 360 degrees it’s impossible to make a game character move left, right, up or down. Scott picked it up very quickly and started developing his own simple games right away. He then had the idea to make a Christmas game for his school friends and after a few afternoons of trial and error he managed to come up with a fun game. I promised him to put the game on my blog as well, so here it is: https://scratch.mit.edu/projects/76626698/. It won’t work on most mobile phones because Scratch uses Flash, so give it a try on your laptop or PC. 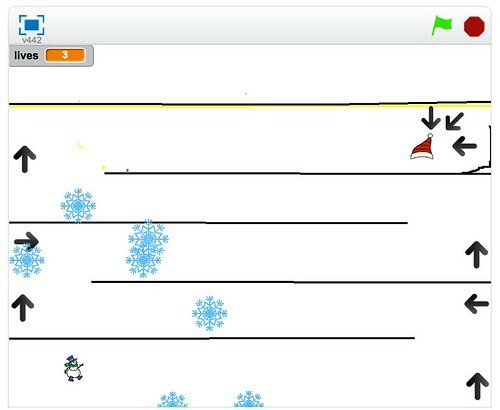 The aim of the game is for the snowman to reach the Christmas hat while avoiding the big snowflakes that fall from the sky. You start the game by clicking the green flag and you can stop by pressing the red button. You have 5 lives in total, each time a snowflake hits you or if you hit one of the walls you will lose a life. If you manage to reach the Christmas hat you will get one extra life. Once you have no lives left you lose. Keep in mind that Scott is only 7 years old (almost 8 he would say, he will turn 8 this week), so it’s not a highly polished game and there are still some minor bugs. But I am quite proud of what he managed to make without almost any help. Enjoy the game and looking forward to your future games Scott!